Written by FuSuSu on 18/08/2018. in Time Management. Updated on 18/08/2018. To manage your money well, you must know how much you spent every month, even every day. Similarly, to manage you time well, you have to know how you are using it. After trying time tracker from online to offline tools, from free to paid apps, I spent years to develop a spreadsheet works that is simple but works like a charm. In short, this time tracker will help you record the time that you used daily, then give you a bird view of how you use it monthly in colorful tables and graphs. Based on the results, you can adjust the way you are using your time for more effectively. You can also use it as a habit tracker tool if you want. There are three sheets in this time tracker spreadsheet. Task : What you have done? Giving each task a name is a good habit in time management skill. Prior : I use ABCDE method of Brian Tracy, you can change to other system in the Data Sheet. D – Delegate: something you should delegate to someone else, but you did it yourself. 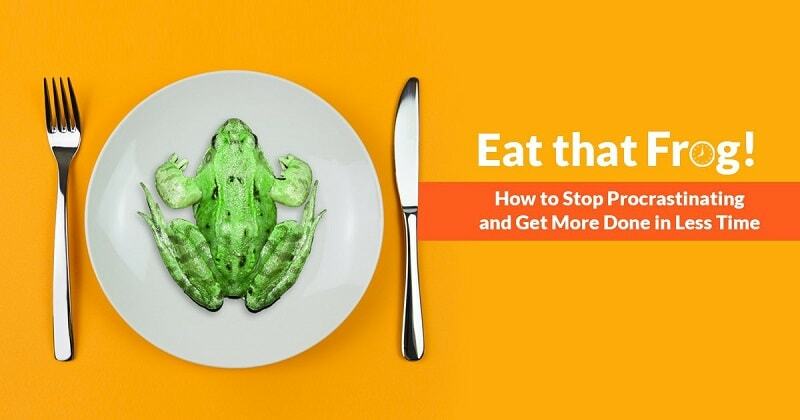 Eat that frog, the most handful book on time management by Brian Tracy. You must not miss it. You can read the sample here. Tag: Keywords used for tracking the tasks in the Report sheet. You can replace Tag1, Tag2… in the Data Sheet. Here is the Tags I used in my Time Tracker Spreadsheet. Plan : time for planning ^^! Long: If you filled both the start and end cell then, this time tracker will automatically calculate the amount of time you spent for that tasks in minutes. If not, just fill in the amount of time that you spent for the task here. Looks colorful and a bit complex, right? But it’s very simple and useful. The number 12 in A2: is the recent month. YIf you want to see the results of past months, just write the number in A3. The default value in A3 is Zero, meant this tool will automatically show you results of recent month. Tag: It\’s the heart of this tool. Tag is the keyword that help you recognize the task or activity that you are tracking. You can edit the Tag Name on Data Sheet. But keep in mind that you shouldn\’t change it too often, because it will only automatically change in the REP sheet, not REC sheet. Effective : It will calculate all the cells with the percentages below 150% in the collumn and let you know the average. You can see the 78%, I call this the “know your time rate”. Assume that we spend 12 hours sleeping, bathing, moving and other personal things. So there are 12 hours you can spend doing useful things. The formula here is (A B C)/12*100%. If that result is high, you are managing your time well. 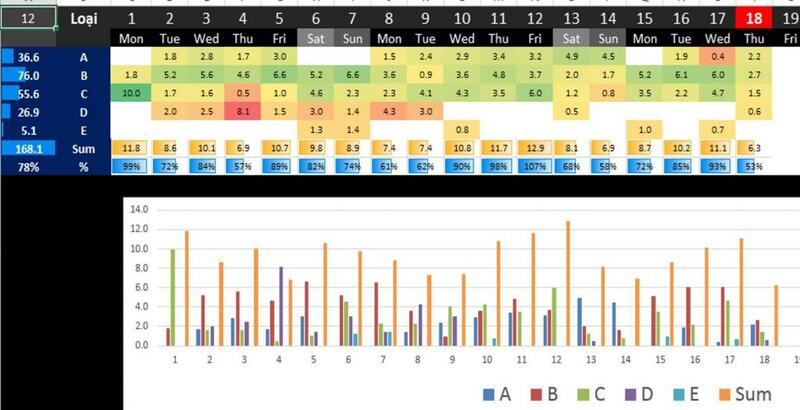 The low result shows that there is too much ineffective use of your time (the guide here is try to reduce D & E time). If you use other system, just change A, B, C, D, E to something you like in the DATA sheet. For each task, if you have not filled in the “end” or “length” column, this tool understands that you are working on this. It will automatically calculate the time from the beginning. Time tracker is essential key to success in time management. To remind yourself do it everyday, just make this the default tab of your web browser when it opens. For example, I need to improve my english. So the tag “Eng” is very important. If you want to reduce time on facebook, try a tag name “face” and set the time limit to 60 minute a day. If you spent 120 hours on facebook, the cell will be coloured as black. Just leave your email below, then I will send you direct link to download this template that help you become the time-master of yourself. Please note that I hate spam, too. To me, a day with red tags is not a problem. But a day with white tags is a problem. White means you did not spend time on that tag. Red, you spent a little time. Remember, a man who exercises each day for 1 minute over a consecutive period of 365 days, will definitely become stronger than a man who exercises for 365 minutes for just one day. So be consistent! Bonus:An useful resource you must see! And another helpful resource is TimeDoctor.com, you\’ll find a lot of free time sheet template there. Also they provide 30 days free trial tools which will help you double your productivity. Hi, I’m really interested in downloading your time tracker template, but it seems the email is not coming, not even in my spam box! Can you send it again manually ? I’ve just done a quick check, it’s because of my mailing system. I’ve fixed it.